There is a clickable map. If you know the number of the tree you can click on this to take you to the list of varieties, below. There is also a pdf file for printing. 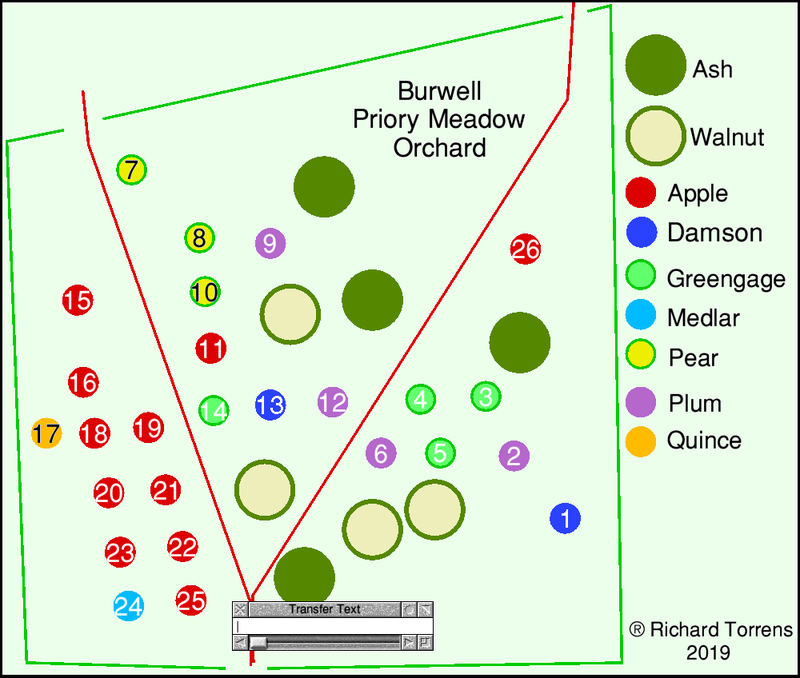 On Saturday 12th January 2019 a community orchard was planted in Priory meadow. This meadow, next to Priory wood, already had five mature walnut trees so was an obvious choice of location. Although the orchard was planned and organised by "A group of Pauline's Swamp-related people" (presumably trustees of Pauline's Swamp - to which I am an advisor) I was not informed or asked for advice. The result is an orchard mostly on the most vigorous rootstocks available so many are unlikely to fruit for 5 or 6 years (i.e. before 2024) and which will eventually reach a height of 20-30 ft. So you will need a very tall ladder to reach most of the apples and pears. The plums and gages are generally smaller trees anyway. There is a second list in number order which has more detail. Map - the number refers to the location map. There is a smaller version of the location map where a click on a tree will take you to the description. Variety - The name of the fruit variety. The link will take you to a page with the description. Rootstock - All are on vigorous rootstock so expect very tall (and very productive) trees. The link will take you to a page with a relevant description.